I heard myself in her these days. She'll repeat to me what i've said to her, in relevant conversations, even if it's something i said a day ago. 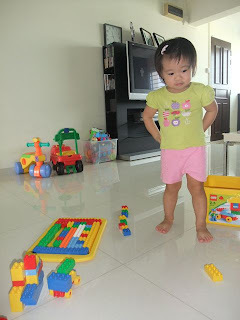 This evening she was arranging her Legos on the cover and after pouring it out on the floor she wanted to do it again. I was telling her that it's time to keep her Legos as it's bedtime. She nonchalantly told me "Last time, mummy". I was a little surprised by her request but let her play it one last time before keeping it away. Really, until i hear her say some things i really don't know that I have said it to her....even on a daily basis. Sometimes when i catch myself saying it, i would feel a little embarrassed. Actually, some phrases are quite harmless...more silly and funny to hear her say it anyway. The best one was on one of the weekends when her cousins were at our place and she took her flashcard, showed it to her youngest cousin (word facing him and picture facing her), and she asked him "What is this, hmm??" the "hmm?" is those high pitched tone which when Ww and I saw it played right in front of us we wanted to laugh ourselves silly. After that i realized she does that very often to her Elmos and stuffed toys too..she'll ask them if they want to sleep or whether they want to eat etc etc. Plus it will end with a "hmm?" geez...i do that all the time with her...know you know why. This says it all. She'll announce to us that she's happy...when we're going out, after we had a good time out, while we're playing tickle and making the bed, while daddy's carrying her to fly and she laughs her heart out, while she's singing heartily (i think she sings like half of her awake time) etc. Her fav play - helping me make the bed...or more like mess the bed. She'll tell me "Lingling go to sleep. Lingling wake up le". Sometimes we'll play rolling around and hiding under the covers. Nowadays she's really good at helping me smoothing the ends and making the quilt cover neat. I always feel Eliza can sleep herself longer but somehow on average she gets 10hr nights and less (esp during those late nights + early mornings), and 1-2hr naps. It varies quite a bit. But somehow, the bedtime has felt easier these days. For now, after brushing teeth, bedtime diapers, and prayers, it's goodnight and off to sleep. I've skipped the reading before bed somehow cos she's very good at extending the reading time and it ends up becomes a tool for her not to sleep + a crying spat if it doesn't end off well. I try reading at other times of the day then, or if i have time, before her bedtime milk / brushing teeth. Anyway, nowadays i've told her that she doesn't need me to pat her but i'll sing or hum a song while i read some stuff. If she starts standing up or scratching the bed netting or whatever, i'll stop singing and ignore her. Normally she'll realize i'm not singing and start ranting that she wants me to sing, which will only happen when she's lying down trying to sleep. So i'll hum & read, while she tangtang and tries to sleep. It's less a struggle and she settles to sleep faster. Though i realized she always have to keep her eyes open until they're so tired she has to close it, and sometimes takes forever (exaggerated obviously..but it feels like it). I have to remind her to close her eyes so that she can sleep...gee..once she closes her eyes voluntarily, she's off to dreamland in seconds. I wonder if after months of pondering over, rationalizing, ignoring the issue, resigning myself to the sad fate of waking up to Eliza's night frustrated scratching; I might have realized something that could ease or eliminate her itching. I'm not sure if it's the way she's going off to sleep (I tell her "mummy's not gonna scratch for you. 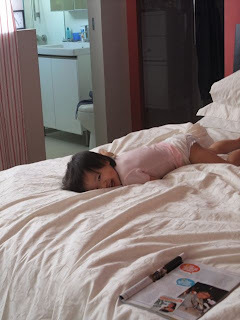 you know how to scratch on your own" + "mummy don't need to patpat you to sleep. Eliza's a big girl now. "), or if it's the bathing. Eliza's has, since 1yr plus, been afraid of the shower because somehow she always opens her eyes when water goes over her face or she breathes in water, she has always bathed in her bathtub. The problem with the bathtub is that after all that soaping, i'm still rinsing her with the same soap and prob the same dirt (not that she's that dirty anyway, but still). Recently, i've used another batch of clean water to rinse her hair and her body before she gets dried. I wonder if that eased the night scratching. I didn't tell my mil that but today's bedtime she was scratching and scratching, just now she woke up and whined cos she was itchy (though, i just waited and listened, and eventually she rolled back to sleep). Maybe it was the bathwater. I think sometimes we run out of places to go but on weekends when there are concerts in the park, we just love it. I think it's part enjoying the music and part letting Eliza run loose to check out other kids. (i don't quite enjoy the feeding Eliza part...cos picnicking dinner means we're on the groundsheet and nothing to hold her in). At this this time round it was quite ok since she was quite hungry. We listened to swing jazz, ate dinner under the cloudy sky, Eliza ran off to play bubbles with another kid and his helper, then she later dragged me off to see two boys playing baseball. it was quite a wet day and there wasn't a lot of people, not the best since you get all the wet grass stuck to you. Still, we love picnics like that...bliss! My mil commented on how did i let the hairdresser cut her hair so short which wasn't the nicest, though we all agreed it made her look cheek-ier. I loved her previous hairstyle (or whatever there was in a mess), and my mil enjoyed clipping her hair in all cute manners. Still at least a shorter fringe will allow me to not have to cut her hair so often, after all it's the fringe that's a bother. Thank God she was super duper cooperative during the hair snipping, to the extent that i think she enjoyed it! I'm always afraid she'll be afraid and will bring my ipodtouch as a backup plan. This time she sat on a 板 so that she's elevated (instead of on my lap previously), and we tell her that she's going to be 美美 after that. I guess it must have been fun for her cos this evening during bedtime she was covering me with her blanket, just like when we go to the hairdressers, and telling me that she's cutting my hair, while using her fingers to pretend that she's cutting my hair. She even had to ensure that my shoulders are covered, like the real thing. She had such a kick at doing so that i had eventually tell her that it's night time and the shop needs to close. my cute girl. i just had to tell Ww what she did after that. It's really interesting to see and listen to how their conversations with you and others play out. A lot of it is learnt from what we say to her and she develops from there. It's amazing how God made toddlers to be language experts (well almost...after all they pick up language at such an amazing rate). It's the end of the work week for me and somehow i'm so looking forward to this weekend to spend with Eliza. The past two weeks has been busy with outings and visitations etc so I'm looking forward to some peaceful home time and simple outing, downstairs at the playground + park and to the library with Eliza. - Daddy's away in Perth on a work trip and i wonder what Eliza's reaction will be when we go pick him up at the airport tomorrow. So far we've told her that daddy has taken an airplane to Perth for work stuff. - Eliza's bitten by the mosquitoes 5 times 2 nights ago. 3 on her cheek nearer her ear, 1 on her forehead and 1 near her elbow. Everytime she gets bitten it swells into a large hard lump and sometimes there's like pus inside. Gee...poor gal... The last time she got bitten it was on her heel and she was so uncomfortable that she refused to bathe, cos she was afraid it would hurt and she walked weird for a half-a-day. Sigh...seems like i have a resident mosquito and so far the mosquito repellent didn't seem to kill it, even though it may have warded it away when it's turned on. It has taken me about 2months+ to get her aquainted with her toothbrush and about 1 month with her brushing her teeth (or more like tongue) on her own and for a few weeks, me helping her brush her teeth. This was not a i-force-you thing to do cos i sensed it would backfire, moreover i didn't want to be brushing the teeth of a struggling and adamant toddler. So far it has been quite good until recently, somehow she would stand beside me while i brush my teeth but wouldn't let me brush hers after i'm done. the first time it happened, i talked for 10mins (trying out all kinds of tactics) before one worked. And it worked like a gem. The crying toothbrush which was sad that it didn't get to clean Eliza's teeth of all the plague. She opened her mouth immediately. And it worked so well, i'm using that everyday. :) I hope we do this so often that toothbrushing becomes a habit....minus the frills which are for now quite fun. Now i'm worried when that tactic will backfire...oops! Still, our toddlers are such unpredictable beings...you never know what silly stuff tickles them silly or makes them more agreeable with you. I have been conscious to be consistent and to insist on some things which i didn't want her to develop a bad habit in. Eliza is very cooperative when it comes to keeping her toys and she can do it well, except for times when she's flying from one thing to another and can't seem to concentrate on the task at hand. She'll do it and flit off to another thing. This is one thing I'm trying to insist on, to finish what one starts. That when it's time to keep toys, we get the task done. Sometimes, she won't agree on doing it. ie today halfway through her brushing the room door opened (cos of the wind and cos i didn't close it yet) and she suddenly wanted to go say 'night night' to ah-ma again. It took some wailing (ya bad enough for my mil to come and ask what happened), and protests before she could calm down and finish brushing her teeth (or at least come to the mummy-brush-your-teeth part). It would have been easier to let her go but i knew it would be harder for her to come back to continue brushing, and it was a good opportunity to teach her the value of finishing one's task (or more like not to be so distracted). Eliza has been expressing interest in going to school and i haven't really moved to really find out more about the playschools. Party because of all the things i've been reading regarding sending toddlers to school at such a young age. But i'm hoping to try out Charis Montessori's parent toddler class which is on saturday. Too bad it's not the nearest from home, else i would even consider their 2 or 3 day preschool. So far from what i've gleaned from the website, i like the small class size and the Christian focus it has. Still gotta go check it out to find out more. 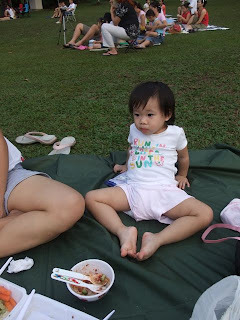 I have told Eliza beforehand that when she goes to school, mummy/daddy/ahma/ahgong will not be there, just teachers and her friends. Is she ok with that? So far she repeats after me. Still we'll try out the parent-toddler class first. My only problem is that it's not near my place that's all. More updates soon.